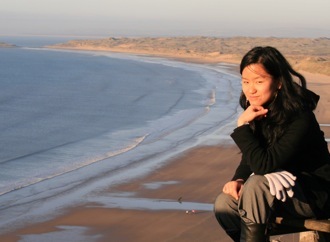 Marita Cheng, one of Forbes World's Top 50 Women in Tech, was the 2012 Young Australian of the Year and is a technology entrepreneur and women in technology advocate. Marita Cheng is the founder and CEO of aubot (formerly called 2Mar Robotics), which makes a telepresence robot, Teleport, for kids with cancer in hospital to attend school, people with a disability to attend work and to monitor and socialise with elderly people. Teleports have been sold to offices, museums, coworking spaces, for kids with cancer in hospitals and for security. As well as telepresence robots, aubot does research and development in robotic arms, virtual reality and autonomous mapping and navigation. aubot has been recognised on a global scale through the Forbes 30 Under 30 Asia in 2016, and through being called "the coolest girl at CES 2014" by VentureBeat magazine. Marita has presented about Teleport at the M.A.P. International CEO Conference in the Philippines in 2016, MIT Technology Review EmTech Singapore in 2015, and the 2014 World Entrepreneurship Forum in Lyon France. In 2015, Marita attended Singularity University's 10-week flagship Graduate Studies Program, held at NASA Ames in Mountain View, funded by a $40,000 scholarship from Google. While there, she cofounded Aipoly. Aipoly's first application recognises objects in real time on a smartphone using convolutional neural networks and relays them to people who are visually impaired. Since launching at CES in January 2016, Aipoly is now available in 23 languages and has been downloaded over 500,000 times. Marita was named the 2012 Young Australian of the Year for demonstrating vision and leadership well beyond her years as the Founder and Executive Director of Robogals Global. Noticing the low number of girls in her engineering classes at the University of Melbourne, Marita rounded up her fellow engineering peers and they went to schools to teach girls robotics, as a way to encourage girls into engineering. While on academic exchange at Imperial College London, Marita expanded the group to London and through innovation and sheer will, Marita then expanded Robogals throughout Australia, the UK, the USA and Japan. The group runs robotics workshops, career talks and various other community activities to introduce young women to engineering. Robogals has now taught 70,000 girls from 11 countries our robotics workshops across 32 chapters. Robogals has been internationally recognised though the Global Engineering Deans Council Diversity in Engineering Award (2014), Grace Hopper Celebration’s Anita Borg Change Agent Award (2011), and the International Youth Foundation’s YouthActionNet Fellowship (2011). Marita regularly travels around Australia presenting her work including appearing on Q&A on ABC beside two Nobel Laureates and the Chief Scientist of Australia (TV audience 600,000), and alongside Ashton Kutcher at Lenovo’s #TechMyWay (online audience 35,000). As well, she has presented overseas at Foxconn's H.Spectrum by Yonglin Healthcare Startup Conference in Taiwan (2016), the 37th Kumon Japan Instructors Conference in Japan (2016), the World Engineering Education Forum in Dubai (2014), and the World Association of Girl Guides and Girl Scouts' World Conference in Hong Kong (2014). Marita has a Bachelor of Engineering (Mechatronics) / Bachelor of Computer Science from the University of Melbourne. She serves on the boards of Robogals Global, the Foundation for Young Australians, and RMIT's New Enterprise Investment Fund, where she helps decide on startup investments, the Victorian State Innovation Expert Panel, and the Clinton Health Access Initiative's Tech Advisory Board. In her spare time, Marita enjoys reading, travelling and daydreaming.